It had been 6 months since I’d crossed the Thai – Lao friendship bridge at Nong Khai, and having ridden 4,500km through the largely less developed Lao and Cambodia, and the confusion of Vietnam, I was quickly reminded of just how convenient and more developed Thailand was than all of these. On the first day back in Thailand, having crossed the border that morning, I think I passed about 5 dead dogs on the sides of the roads, which, as well as not being pleasant, instantly filled me with a bit of dread at the thought of being chased by more lunatic dogs, with Thailand having the worst culprits. Seriously, there is something about a cyclist that makes these dogs foam at the mouth. 1. Along the sides of the roads are these little huts which are perfect for getting out of the sun or the rain , and 2. That I was back in one of the worlds food meccas. Chilling in one of the huts you find on the side of nearly every road. It was now 03/07/18 and I had a 30 day VISA for Thailand. I had to cross into Myanmar, 750km away, as close to the 25/07/18 as possible, so I knew I had plenty of time to take in central Thailand. I’d ridden a few days in Thailand, and it was now time to ride into Bangkok, 80km from the Chachoengsaeo, the town I was in. I was excited to experience Bangkok and especially to cycle into the heart of it, but I must admit, I did have a preconceived idea of Bangkok in my mind. You get to know a city in a different way when cycling in. The morning was great, with me choosing the quiet back roads which took me past some stunning, local temples. It was all going so well, but I knew that I’d be hitting some bigger roads leading into Bangkok at some point. Now, big roads I can deal with, but big roads under construction, not so fun. For 15km it was dust chewing, pot holes swerving, nail dodging and truck skimming. I soon hit the outskirts of Bangkok which continued for about 40km, with some big busy intersections to contend with. I must say, once into the city limits, Mapsme did a sterling job in guiding Surly Temple and I on the quietest roads as I rolled into Bangkok, which was great. Quite possibly the coolest bus I’ve ever seen! I arrived into the heart of Bangkok and my preconceived idea of Bangkok was instantly questioned. Bangkoks infamousity is not at all evident, if you’re not looking for it. I stayed near Saphan Taksin, a local area, right by the Chao Phraya River, the largest waterway in Bangkok. My Airbnb was on a very local street, which was perfect. Real authentic local life. Darren, who’d I’d spent time with in Chiang Mai when I first arrived and who I’d be meeting the next day, had lived in BKK for a number of years and had recommended some restaurants in and around the area. The first was Prachak Roast Duck; “ Hands down the best duck and egg noodles anywhere” he said. Prachak Roast Duck, for me, is the quintessential street food restaurant that hasn’t changed for years. When I’d heard stories about BKK and Chinatown from 25 years ago, this is what I envisaged. I’m only basing that on ridiculous movies like Big Trouble in Little China or Jean Claude Van Damme movies, none of which are even set in Bangkok. A no frills restaurant, where, if eating alone, like myself, you’ll end up sitting on a small round table with 3 other people, heads over bowls, brushing elbows and listening to slurping, which is all part of the experience. As for the food, I can’t comment on Darrens comment, but it was super tasty and you’d be proud to have it in your own recipe arsenal. It’s when you get a bowl of food like this that you really appreciate the simplicity of food. Rich, soft, and a perfect umami flavour. The following day I left Surly Temple behind and set out to explore on foot. Just walking without any agenda or direction is a beautiful thing and can take you to the least expected of places. I just walked, not knowing where I was going. I stumbled across an old street selling different spices which was cool. I took a turn and happened upon a large, newly built church. Now, I’m not religious, however, there’s something I enjoy about the silence of a church, temple or any religious building that offers a beautiful silence, and so, I entered and sat for 30 mins with my eyes closed, it was great. I found out a little while after that this church had also been visited by Pope John Paul II. That evening I met with Darren and his brother-in-law, Pridi, for dinner. I’d spent some time with Darren in Chiang Mai when I first started this journey, which had been great, so I was excited to meet up with him again. In a past life, I’d met Pridi once before in the UK when he was over visiting with Darren and Note, Darrens wife, and he’s a great guy. Dinner was at Krua Apsorn, an outstanding restaurant described as “ A restaurant that only locals and foodies in-the-know head to” which serves excellent Thai food, in this very unassuming restaurant. Darren and Pridi ordered and they didn’t disappoint. Crab omelette, crab cakes, green curry, Som Tam ( Papaya Salad) and rice which were all delicious. The crab omelette in particular was excellent. A local folk band in a back street bar. We then when to one of Bangkoks most famous and old ice cream parlours which serves “the best durian ice-cream in Bangkok”. Without a doubt the most interesting ice cream I’ve ever had, and that’s coming from someone who made wasabi and lime sorbet for a dinner party. Durian has to be one of the strongest smelling foods in the world, so much so, it is banned on most public transport in Malaysia. It’s funny, you’ll see a sign in a hotel room saying “ No drugs, no explosives, no durian”. It smells like a combination of really bad feet and off milk. Durian is super creamy as a fruit, but turn it into an ice-cream and you’ve got the creamiest ice cream ever. It was so interesting and delicious, the three of us all had a second bowl. Khun Heng, Darrens father-in-law, and Note and Pridi’s father had made sure I let him know when I would be in Bangkok, and having done so, had arranged to fly down and meet the following day for lunch, which I was excited about. I met Khun Heng and Darren at Phaya Thai metro station and was greeted with a very friendly hug from Khun Heng, which I just thought was great. There’s certainly no shortage of amazing restaurants in Bangkok, so I was surprised and intrigued when Darren had said we were going to a restaurant 45 minutes drive out of Bangkok. “The best and most famous giant river prawns in Thailand, from Ayutthaya” Khun Heng explained, as our taxi driver sped down the highway, leaving the concentration of high-rises behind us. “Je Dum restaurant is very popular with many famous people and The Princess” Khun Heng continued. Giant freshwater river prawns are one of the most prestigious foods in Thailand, something little known to most westerners visiting, so this felt like a special experience. Famous fresh water giant river prawns at Je Dum restaurant. You’d easily walk past Je Dum restaurant without battering an eye lid, as there is nothing to suggest the popularity of this restaurant from the front. Even when you enter through the wobbly sliding doors, its reputation and popularity amongst the famous and dignitaries only evident by the walls which are laden with hundreds of pictures of the many famous faces that enjoy the incredible food on offer, and especially the giant river prawns. The owner, identified by the hundreds of photos of her with these esteemed guests, seemed to instantly recognise Khun Heng, who was greeted as friend. Je Dum is one of those restaurants that if you went without a local, you’d completely miss the experience, so Khun Hung took the reigns and ordered with out any question for Darren and I, which I thought was great. I was more than happy to be ordered for, not something I’m usually that comfortable with, but with Khun Heng, you know he has your experience in mind, as is his kindness. Dish after dish arrived at our table, with Khun Heng providing a description of each. 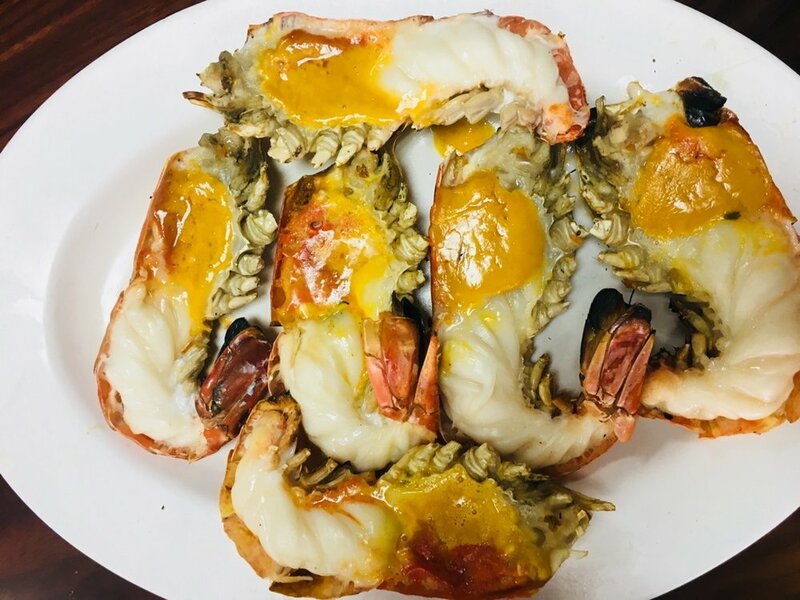 The river prawns are as outstanding in flavour as they are in size with a beautifully sweet, meaty flavor, with the head filled with a prawn roe and head butter that is velvety smooth, rich and super delicious. The Lotus root also needs mentioning as well, as these expensive roots from the much used lotus flower are absolutely delicious. All food was delicious and the experience rich. On the way out, we had a couple of photos, and the owner asked to have a photo of us, which felt very special. Khun Heng, Darren and I. Notice the bags Darren is holding. Khun Heng had ordered takeout as well to fly back to Lampang with for dinner for his wife. I thought that was great. “This is for you. Very good with beer” he added, with a smile. “This is banana leaf baked rice” passing me another bag. “Wow, thank you so much” The generosity of this wonderful man rendering me almost speechless again. Khun Heng, Darren and I on our way back from Je Dum. I think we all had a quick nap 5 minutes after this photo and after our amazing lunch. I think we all then had a nap as we heading back to BKK, where we headed straight to the airport to drop Khun Heng off to fly back to Lampang with his take away from Je Dum. Literally a flying visit. We said our goodbyes, and I my thanks again to Khun Heng. He and Darren and both great company and it was a real pleasure. I took a long walk back towards the area I was staying at, about 1 hours walk away, stopping on route for a craft beer and to enjoy the sour pork Khun Heng had given me. I still had a few more days in Bangkok, and the world cup was coming to a close, with England playing Croatia in the semi finals. I hadn’t really followed it too much, but thought I’d stay up to watch it, with kick off at 1.30am. I woke the following morning with a bit of a fuzzy head hangover, something I hadn’t had for a while and certainly hadn’t missed. I decided at the point, with my Vipassana meditation retreat a month away, that I would stop drinking until then to apply some discipline in preparation. Khun Heng had asked for my number to stay in contact, and was surprised to get a message from him saying that he was back in BKK again, 2 days after he had left. We met at Phaya Thai metro station having waited an hour and fifteen for Khun Heng. Friday evening rush hour in Bangkok is pretty hectic. I had no idea where we were going, but based on my previous dining experiences with Khun Heng and knowing his love for good food, it was bound to be delicious, and boy did it deliver on all fronts. Lin –Fa is a modern and sophisticated Cantonese restaurant within the equally grand 5* Sukosol Hotel. Whilst I wasn’t necessarily scruffy, I certainly didn’t feel appropriately dressed for a restaurant like this, with my sandals on and rucksack on my back. Nevertheless, we sat and both looked at the incredible menu showcasing some of the finest Cantonese dishes. “Wow, what a menu” I said, my mouth watering at the sound of the dishes and my eyes watering at the prices. Khun Heng again took the reigns ordering shrimp cakes, braised beef, chicken with flat noodles and vegetables, and a Chinese soup delicacy called “Buddha jumps over the wall”. “You know Buddha jumps over the wall?”, Khun Heng asked. This was most definitely the first time I’d heard of this awesomely named dish. Buddha jumps over the wall, or Buddha’s temptation is a shark fin soup delicacy originating from Fujian Province, China, dating back 200 years to the Qing Dynasty. The dish has had many names in its history, but Buddha jumps over the wall, named rather whimsically, because the smell is so attractive, that even Buddha wants to break the rules of not having meat, and would jump over wall to get to it. The soup consists of over 30 different ingredients, including shark fin, scallops, sea cucumber, abalone, fish maw, Jinhua ham, quails eggs and Chinese black chicken, to name a few, and takes 3 days to make, with the ingredients added at very precise times. As the food arrived, so did Pridi and his girlfriend June, which was a great surprise, as when I’d asked before, Khun Heng said they wouldn’t be able to join. The food was outstanding, with the Buddha jumps over the wall a master class in developing incredibly rich flavour, and the shrimp cakes, delicious soft inside with an onomatopoeic “crunch” exterior. I didn't get any photos as it wasn’t really appropriate and it was nice to just enjoy the experience without need for photographs. You’ll just have to take my word for it. As I said in my second blog post many months ago ‘A taste of things to come’, “ there’s going to be a few frowned upon things on the menu”, and this was one of them. Although frowned upon, my conscience understands. Pridi and June are great company and it was great to have them both there and to hear more about them. When Kung Heng received the bill, I asked “I would like to pay, if I may?”, with Khun Heng replying “ you may not”. Which was a funny response and very kind again. Following dinner, we all took a taxi to China town where we walked down a small back alley to a very small food stall cooking very simple flat noodle with egg. “ You are allowed to watch the chef, but no photo’s or video” Pridi explained. “The family are very protective of their recipe as it is super good”. The four of us had a very small plate of noodles each which were very delicious, and at the complete opposite end of the spectrum to where we had just had dinner, but no less of an experience. ‘Sweet time’ is a famous Chinese-style dessert stall on Yaowarat Rd, Chinatown, that offer a selection of very interesting, brightly coloured array of desserts. Pridi suggested a dessert for me, which was very interesting and peculiar. Soft, chewy, bumble gum textured tapioca starch balls in a hot ginger syrup. I’ll happily admit that it really wasn’t my thing. The whole thing seemed a little style over substance, but a nice experience nonetheless. What an incredible experience this continued to be. We arrived at Arima Onsen in the Silom area of Bangkok, and took a seat in a quiet room full of other people for our foot massage. Soon enough, I am sat with the biggest, uncontrollable grin on my face, in danger of bursting into hysterics at any moment. Not because it felt amazing or that it tickled; it did, but because a fairly portly Asian man sat just 10 feet away having his feet massaged, fast asleep and snoring soooo loud. It really got me! I just couldn’t stop smiling, it hurt. This caught the attention of the 10 masseurs who all started quietly giggling amongst themselves and watching me as I sat there, cheeks aching, stopping myself from bursting into hysterics in this otherwise quiet room, but for the fog horn Asian man. Once relaxed, the snoring seemed to disappear into the void between consciousness and I think I dozed off during my massage. When I woke, Khun Heng spoke in a sleepy voice “now we have full body massage”. It was only my 3rd massage since I’d been away, and actually, 2 of those times had now been with with Khun Heng. The man likes massages. It was gone midnight when Khun Heng and I floated out of Arima Onsen Spa, and if there’s one thing I’d learnt since being on this adventure, is that Southeast Asian people enjoy a late night feast, and that’s exactly what we did. Silom is a popular area in Bangkok amongst Japanese, so of course, a large bowl of spicy ramen was in order to accompany our interesting conversations, where I learnt more about Khung Heng. After the Japanese, we said goodnight and wished each other well again, and I took a late night, 30 minute walk back through the streets to my hotel, smiling at another incredible experience with my friend, Khung Heng. As a globally known city, Bangkoks reputation is infamous, and somewhat unjust. Tell someone you’re a single guy spending a week in Bangkok, and visions of ping pong balls, red lights and questionable Adams apple’s will come to mind. I know, I was one of those who easily painted the majority, based on the minority. Whilst there is no denying Bangkoks seedier side, if you weren’t looking for it, you wouldn’t necessarily notice it. Instead, you’ll find a bustling, eclectic and intriguing cultural city that offers a walk through the ages. Back streets laden with old fashioned mechanics that wouldn’t have look out of place at the beginning of the last century, spice markets, textiles, large modern malls, river waterways everywhere and skyscapers. Street food isn’t as obviously prevalent here as it is in other cities, but in the absence of street food, are restaurants serving every type of cuisine going, with a price range to suit nearly every budget. Bangkok, I’m sorry I judged you before I experienced you. You rock. Next few blogs with be coming over the next few weeks! Hope you enjoy and are well and happy.